Sometimes the problem might come from the internet service provider when the internet connection is down due to various technical/hardware problems. Even such cases, you will see “the internet connection is limited” or “no internet access” message. You can contact your service provider to fix it. 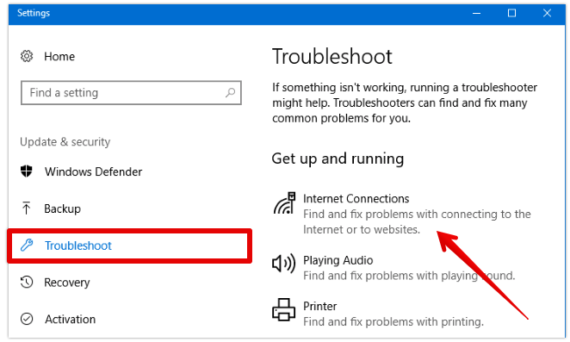 After making sure there is no problem at ISP side, you should then follow this post to solve “internet connection is limited” “no internet” error in Windows, and Mac. To connect to the internet, you will need a router. It takes responsibility for managing the traffic and routing the internet to the connected devices. However, due to some fatal errors, the router might fail to route the traffic and cannot handle the requests. The result is that you will see the “internet connection is limited” error. You should think about restarting your home router to reset the conjunction and packets. Just press the Power button on your router to turn it off and wait for a couple of minutes before powering it on. Right-click on My Computer and choose Manage. Click on Device Manager from the menu to expand Network Adapters. Right click on it and select Disable. Once done, go to Network adapters and re-enable the network adapter that you disabled earlier. Wait for a few minutes and check if the yellow triangle symbol on the Ethernet/Wi-Fi icon has disappeared. If you still encounter the “Internet Connection is Limited” error, you should use an alternative DNS. Using custom DNS will help the internet connection faster, but you should be careful when choosing a DNS provider. So, make sure you use secure and trusted DNS servers for security reasons. Simply follow the below steps to change the DNS servers on your computer to fix the “limited internet errors”. Click on Properties of the connected device. 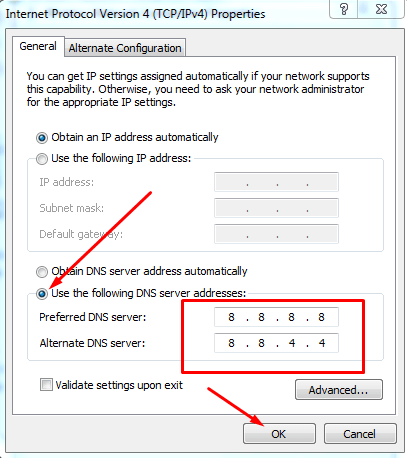 Select TCP/IPv4 properties option and then set your DNS server to Google’s DNS/Open DNS as shown below. Right-click on the connectivity icon and then choose Troubleshoot Problems. After clicking on it, it will then detect the problems. If your Windows can detect the error, there will be possible solutions for you to apply just with a single click. Apple recommends Mac users to keep their drivers and system updated to avoid unexpected errors. So, before fixing No Internet error on your Mac, you should ensure your computer is updated to the latest MacOS firmware with all the network drivers installed. First, you should check to make sure your connection is working fine. You should have properly connected to a network through Ethernet or W-Fi. If you use Ethernet, unplug the cable, clean the dust at ports and plug it back again. Simply power down your modem or router for few seconds and then again switch it and check if it can fix the “limited internet access” without any additional troubleshooting. You should also contact your ISP if you are encountering network problem or downtime. If everything is still working fine and you are not able to surf the internet due to this limited internet access or no internet error, you should check your TCP/IP and DNS settings. Choose Network > Wi-Fi > Advanced. Next, switch to TCP/IP tab. 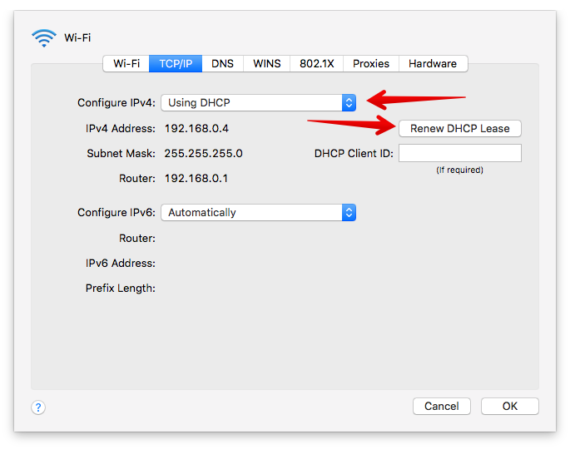 Click on Renew DHCP Lease to update your IPv4 address and subnet mask. Switch to DNS tab and then add custom DNS servers like Google DNS. If cannot access the internet on your Android device’s browser, then you are using a poor internet connection. There might be a cross mark (x) or (!) mark on your device if the internet connectivity is limited. However, it is very easy to troubleshoot this error on Android by checking mobile data and roaming. The first fix thing you should do is check whether your mobile data connection is already turned on. Sometimes you might forget turning on mobile data for browsing the internet. Enable mobile data and make sure you have sufficient mobile data balance to surf the internet. If you are traveling aboard, remember to enable Data Roaming to access the internet. These are potential solutions to fix “the internet connection is limited” or “no internet access” error. If you feel this post useful, share this post to the social network.